The average American consumes almost 20 teaspoons of sugar per day. Do you need a sugar detox? The average American consumes almost 20 teaspoons of sugar per day. Let’s break that down: It’s about equal to a serving of jelly beans plus nine Hershey’s Kisses plus a couple of Double Stuf Oreos, plus a couple of brownies. While this example may seem extreme outside of a rare holiday, a review of packaged foods found that sugar has crept into our food supply in astonishing numbers. Up to 75 percent of packaged foods, including breakfast cereals, granola bars, flavored yogurts (even the fruit-flavored varieties), soups, breads and condiments, contain added sugars, causing us to take in excessive amounts — whether you’re having dessert or not. It probably doesn’t take a nutrition or medical genius to recognize that this amount of sugar isn’t doing us any favors, but it’s important to point out just how damaging it can be. Over time, added sugars can mess up your metabolism, play a role in weight problems, raise the risk of heart disease, diabetes, and tooth decay, exacerbate acne and more. In order to dial back the damage, you need to learn a few sugar facts first. Natural sugars are found in foods like yogurt, milk and fruits, and they don’t lead to the same health problems that added sugars do. Think of it this way: Whole foods contain a natural package of health promoting substances, like calcium, magnesium, potassium and fiber (from fruits). Because of the goodness these sugars come along with, you can ease up on worrying about them. There is one exception. It’s hard to argue with the benefits of fruit, but you can overdo juice. Juice lacks the fiber contained in fruit, and because a cup of juice contains more than one piece of fruit, you get more fructose — the natural sugar. If you’re drinking more than one cup of juice per day (or serving more to your children), you’ll want to re-think your drinks. The American Heart Association advises capping added sugars at 6 teaspoons (25 grams) per day for women and 9 teaspoons (36 g) per day for men. Certainly, a little sugar can be fine, especially if it’s used to add flavor to nutritious foods. A drizzle of maple syrup over roasted carrots or a spoonful of honey over a fruit-and-nut-filled overnight oatmeal can bring more flavor to foods that supply vitamins, minerals and other natural health-boosters. But know the difference between a drizzle and a pour. The American Heart Association advises capping added sugars at 6 teaspoons (25 grams) per day for women and 9 teaspoons (36 g) per day for men. This can add up quickly! To eliminate added sugars, you first need to find them, which is no easy feat. 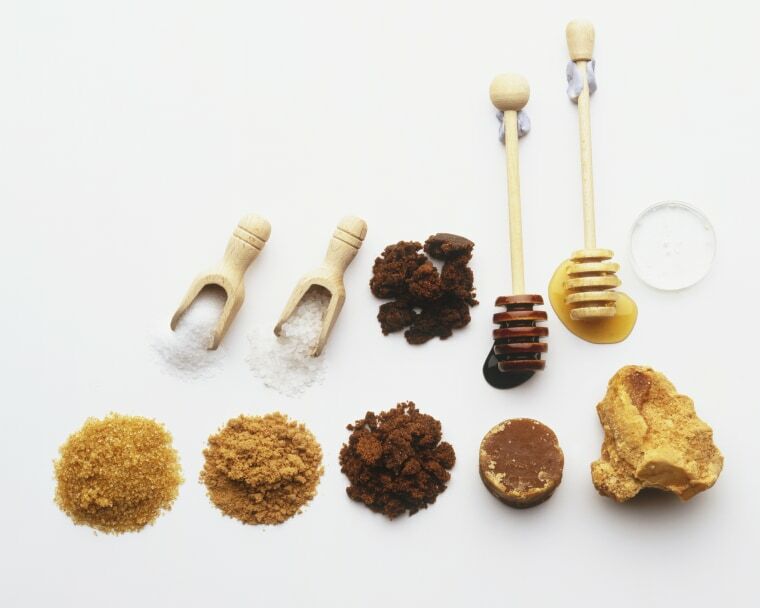 For one thing, sugar goes by many different names. Common ones include agave, brown sugar, cane juice, cane sugar, coconut palm sugar, evaporated cane juice, fruit juice concentrate (such as apple or pear juice concentrate), honey, brown rice syrup, maple syrup and high fructose corn syrup. Until the updated label makes its way to shelves (reportedly in early 2020), you’ll have to make do with the current one. To make the best of it, compare similar products (say, one bread to another), looking at the Nutrition Facts label to find foods with the lowest levels. You may also want to do your own calculations. Just recognizing that 9 grams of sugar is more than 2 teaspoons’ worth might help point you toward a different product. Finally, make no mistake: Even healthy-sounding sugars can contribute to health problems. Though some, like maple syrup and molasses, contain miniscule amounts of antioxidants or minerals, you shouldn’t be eating enough of them to get health perks. According to the latest government report, 49 percent of adults and 63 percent of children are sipping sugary drinks every day. In fact, sugar sweetened drinks are the leading source of added sugars in our diets. The issue with these sips goes beyond the fact that they provide a lot of calories, yet are devoid of nutrition. It has been shown that your body doesn’t process calories from drinks in the same way it processes those from food, and sugar sweetened drinks may prompt your body to make and store more fat. Certainly, replacing your daily sugary drink with water or another unsweetened beverage is a good goal. Whether your sweet sip is soda, sweetened tea, a sports drink, a sweetened coffee concoction or even a seemingly healthy sweetened chai or matcha latte, try to cut back. The grocery store is a landmine of sneaky sugar traps. Take Honey Nut Cheerios, a best-selling breakfast cereal. It has about as much sugar as an Old Fashioned Dunkin Donut. Plain Greek yogurt has 4 g of natural sugars; flavored versions can contain upwards of 16 g of sugar. That’s three extra teaspoons. Even your granola bar could be a candy bar in disguise. Honey Nut Cheerios, a best-selling breakfast cereal, has about as much sugar as an Old Fashioned Dunkin Donut. It’s a mistake to assume something that seems healthy or is organic is low in added sugars. Don’t be duped by these health halos. Always check labels to find a lower sugar choice. It’s tempting to want to replace added sugars with artificial ones, but it’s not necessarily the best move. Though these sweeteners like sucralose, aspartame and saccharin are deemed safe by the FDA — meaning there is no clear evidence of cancer risk — questions remain. For one, some studies have observed that use of these products is linked with weight gain. Whether that means that sweeteners cause weight gain, or that people who gain weight turn to these sweeteners remains unknown. But there are also other causes for concern, according to Christopher Gardner, PhD, Professor Medicine at Stanford Prevention Research Center. Dr. Gardner explains that it’s possible that these zero-calorie sweeteners prime us to prefer sugary foods and drinks or make naturally sweet foods, like fruit, less appealing. It’s also possible that sugar substitutes can alter your feelings of hunger and fullness, prompting you to eat more. And they may lead to calorie confusion — reducing awareness of your intake or giving you a false sense of security that leads to overconsuming other foods since you’re sparing calories in the first place. One thing is clear: These are obviously not good scenarios for your body. There’s also the matter of your microbiome, the diverse ecosystem of healthy gut bacteria that powers your immune system and more. A popular study found that sugar substitutes alter it in undesirable ways. The composition of your microbiome can impact your health and wellbeing; it’s linked to everything from allergies to obesity. Though we’re a long way from knowing with any certainty the real impact of artificial sweeteners on your microbiome, this study provides a clue. It’s worth noting that much of the research pointing to problems with sugar substitutes were either done in animals (and you probably don’t need me to tell you animals aren’t the same as humans), or have other limitations (looking at behaviors over time rather than detecting cause and effect). However, if you think a natural-based substitute, like monk fruit extract or stevia, is a good alternative, know that we don’t have solid evidence on the potential downsides, like those described above. It remains to be seen. At the end of the day, this one comes down to personal choice. Dr. Gardner suggests avoiding sugar substitutes, pointing out that they’re only in less healthy fare, anyway. “I have never seen an artificial sweetener in broccoli, or cauliflower or kale, or eggs, or salmon or grass fed beef, or pasture-raised poultry,” he says. Alice Lichtenstein, D.Sc, senior scientist and director of the Cardiovascular Nutrition Laboratory at the HNRCA, Stanley N. Gershoff Professor of Nutrition Science and Policy at the Friedman School offers a little more leeway. "Optimally, we would encourage people to drink water in place of sugar sweetened beverages. However, given that is not always an effective strategy, we need to consider the risk/benefit ratio of other options,” she says. While the science is still a bit murky on artificial sweeteners, we know for sure that there are poor health outcomes related to sugar intake, and especially with intake of sugary drinks.